The New York metropolitan area, also known as Metropolitan New York, Greater New York, or the Tri-State area, is the most populous metropolitan area in the United States and is also one of the most populous in the world. 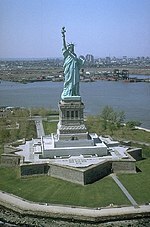 The metropolitan area is defined by the U.S. Office of Management and Budget as the New York-Northern New Jersey-Long Island, New York-New Jersey-Pennsylvania Metropolitan Statistical Area (MSA), with a population of 18,897,109 as of the 2010 census. (roughly 1 in 16 Americans) as of 2010. The MSA is further subdivided into four metropolitan divisions. The 23-county metropolitan area includes ten counties in New York State (those coinciding with the five boroughs of New York City, the two counties of Long Island, and three counties in the lower Hudson Valley); 12 counties in Northern and Central New Jersey; and one county in northeastern Pennsylvania. The largest urbanized area in the United States is at the heart of the metropolitan area, the New York–Newark, NY–NJ–CT Urbanized Area (estimated to have a population of 18,319,939 as of 2008). The region also serves as the heart of the Northeast megalopolis. Based on commuting patterns, the Office of Management and Budget also defines a wider region consisting of the New York metropolitan area plus five adjacent metropolitan areas. The area is known as the New York-Newark-Bridgeport, New York-New Jersey-Connecticut-Pennsylvania Combined Statistical Area (CSA), with an estimated population of 22,232,494 as of 2009. About one out of every fifteen Americans resides in this region, which includes seven additional counties in New York, New Jersey, and Connecticut, and is often referred to as the Tri-state Area and less commonly the Tri-State Region (leaving out Pennsylvania). However, the New York City television designated market area (DMA) includes Pike County, Pennsylvania,, which is also included in the CSA. This wider region includes the largest city in the United States (New York City), the five largest cities in New Jersey (Newark, Jersey City, Elizabeth, Paterson and Trenton) and six of the seven largest cities in Connecticut (Bridgeport, New Haven, Stamford, Waterbury, Norwalk & Danbury). The total land area of the extended metropolitan area is 11,842 sq mi (30,671 km2). The counties and county groupings constituting the New York metropolitan area are listed below with 2009 U.S. Census Bureau estimates of their populations. All five areas can be (and often are) further divided. For instance, Long Island can be divided into the South and North Shores (usually when speaking about Nassau County), Western Suffolk, and the East End. The Hudson Valley and Connecticut are sometimes grouped together and referred to as the Northern Suburbs, largely because of the shared usage of Metro-North Railroad. Sixty-three percent of the population lives in the 43% of the land area that is east of the Ambrose Channel/The Narrows/Hudson River; Thirty-seven percent of the population lives in the 57% of the land area that is west of the Ambrose Channel/The Narrows/Hudson River. The following is a list of principal cities in the New York-Newark-Bridgeport Combined Statistical Area with 2005 U.S. Census Bureau estimates of their population. Principal cities are generally those where there is a greater number of jobs than employed residents. The metropolitan area is partly defined by the areas from which people commute into New York City . The city is served by three primary commuter rail systems plus Amtrak. An Acela Express train going to New York City. The Acela Express is the first and only high-speed rail service in the country. The Long Island Rail Road (LIRR), the busiest commuter railroad in the United States, is operated by the Metropolitan Transportation Authority (MTA), an agency of New York State. It has two major terminals at Pennsylvania Station in Midtown Manhattan and Flatbush Avenue in Downtown Brooklyn, with a minor terminal at Long Island City station and a major transfer point at Jamaica station in Queens. Metro-North Railroad (MNRR), the second busiest commuter railroad in the United States, is also operated by the MTA, but in conjunction with the Connecticut Department of Transportation and New Jersey Transit. Its major terminal is Grand Central Terminal. Trains on the Port Jervis Line and Pascack Valley Line terminate at Hoboken Terminal; commuters may transfer at either Secaucus Junction for New Jersey Transit trains to New York Pennsylvania Station or at Hoboken Terminal for PATH trains into Manhattan. New Jersey Transit (NJT), the third busiest commuter railroad in the United States by passenger miles and also third in trips when direct operated and purchased transportation services are both included (fourth if only direct operated are included), is operated by the New Jersey Transit Corporation, an agency of New Jersey, in conjunction with Metro-North and Amtrak. A map of the system can be found here. It has major terminals at Pennsylvania Station in Manhattan, Hoboken Terminal in Hoboken, and Pennsylvania Station in Newark, with a major transfer point at Secaucus Junction. New Jersey transit also operates a light rail system in Hudson County, as well as the Newark City Subway. NJ Transit also consists of commuter buses operating in and out of Manhattan. Additionally, the Port Authority of New York and New Jersey, an agency of the states of New York and New Jersey, operates the PATH system. This heavy rail transportation service serves the counties of New York, Hudson and Essex. A map can be found here. New Jersey Transit, Academy Bus, Coach USA, Adirondack Trailways (under the names of New York Trailways, Pine Hill Trailways, as well as Adirondack Trailways) and several other companies operate commuter coaches into the Port Authority Bus Terminal in Manhattan, and many other bus services in New Jersey. Bus services also operate in other nearby counties in the states of New York and Connecticut, but most terminate at a subway terminal or other rail station. The metropolitan area is served by three major airports. The U.S. Census Bureau first designated metropolitan areas in 1950 as standard metropolitan areas (SMAs). The "New York-Northeastern NJ SMA" was defined to include 17 counties: 9 in New York (the five boroughs of New York City, Nassau, Suffolk, Westchester, Rockland) and 8 in New Jersey (Bergen, Hudson, Pasaic, Essex, Union, Morris, Somerset, Middlesex). In 1960, the metropolitan area standards were modified and renamed standard metropolitan statistical areas (SMSAs). The new standards resulted in the splitting of the former SMA into several pieces: the nine New York counties became the "New York SMSA"; three of the New Jersey counties (Essex, Union, Morris) became the "Newark SMSA"; two other New Jersey counties (Bergen, Passaic) became the "Paterson-Passaic-Clifton SMSA"; Hudson County was designated the "Jersey City SMSA"; and Middlesex and Somerset counties lost their metropolitan status. In 1973, a new set of metropolitan area standards resulted in further changes: Nassau and Suffolk counties were split off as their own SMSA ("Nassau-Suffolk SMSA"); Bergen County (originally part of the Paterson-Clifton-Passaic SMSA) was transferred to the New York SMSA; the New York SMSA also received Putnam County (previously non-metropolitan); Somerset County was added to the Newark SMSA; and two new SMSAs, the "New Brunswick-Perth Amboy-Sayreville SMSA" (Middlesex County) and "Long Branch-Asbury Park SMSA" (Monmouth County), were established. In 1983, the concept of a consolidated metropolitan statistical area (CMSA) was first implemented. A CMSA consisted of several primary metropolitan statistical areas (PMSAs), which were individual employment centers within a wider labor market area. The "New York-Northern New Jersey-Long Island CMSA" consisted of 12 PMSAs. Seven PMSAs were based on the original 1950 New York SMA that were split up: New York, Bergen-Passaic, Jersey City, Middlesex-Somerset-Hunterdon (Hunterdon added for the first time), Monmouth-Ocean (Ocean added for the first time), Nassau-Suffolk, and Newark (Sussex added for the first time). One additional PMSA was the Orange County PMSA (previously the Newburgh-Middletown SMSA). The other four PMSAs were former SMSAs in Connecticut: Bridgeport, Stamford, Norwalk, and Danbury. In 1993, four PMSAs were added to the New York-Northern New Jersey-Long Island CMSA: Trenton PMSA (Mercer County), Dutchess County PMSA, Waterbury PMSA, and New Haven PMSA. Several new counties were also added to the CMSA: Sussex, Warren, and Pike. The CMSA model was originally utilized for tabulating data from the 2000 census. In 2003, a new set of standards was established using the core-based statistical area (CBSA) model was adopted and remains in use as of 2010. The CBSA model resulted in the splitting up of the old CMSA into several metropolitan statistical areas: New York-Northern New Jersey-Long Island, Poughkeepsie-Newburgh-Middletown, Trenton-Ewing, Bridgeport-Stamford-Norwalk (includes Danbury), and New Haven-Milford (includes Waterbury). Since its foundation as the mercantile colony of New Netherland the metropolitan area has been noted for ethnic diversity. Beginning in the later 19th century, the New York Area was in large degree divided among Italians, Irish, German, Jewish, and Chinese populations. The Polish and Lebanese also established small communities. Thanks to successive waves of immigration, begun in earnest in the 19th century and continuing today, the area's diversity continues to grow. 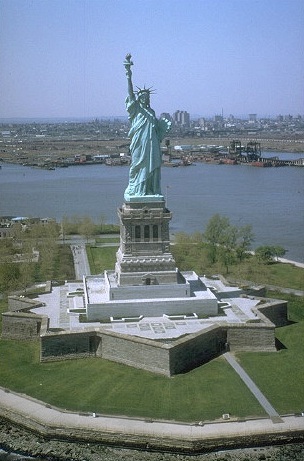 The states of New York, New Jersey, and Connecticut are all ranked among the top 10 fastest-growing immigration states in America, and great numbers of recent immigrants from across Latin America, East Asia, and the Caribbean now call the New York metropolitan area home. While prominent ethnic neighborhoods in the region are too numerous to list, there are multiple neighborhoods with large German, Jewish, Puerto Rican, Dominican, Cuban, Nicaraguan, Colombian, Jamaican, Haitian, Ecuadorian, Guatemalan, Mexican, Chinese, Trinidadian, Filipino, Russian, Turkish, Arab, Albanian, Korean, Japanese, Indian, Pakistani, Bangladeshi, Italian, Irish, Salvadorian, Peruvian, Greek, and Polish communities. The cuisines of virtually every major ethnic group are at least partially represented in the area, with the culinary landscape of New York changing slightly from year to year as new arrivals settle in. The New York metropolitan area hosts a religious diversity in line with its ethnic diversity. Houses of worship exist for numerous Christian denominations, especially Catholicism but also various churches within both Eastern Orthodoxy and Protestantism. New York has a large Jewish population, is a major center of Orthodox Judaism and is home to the headquarters of many Hasidic movements, particularly in the borough of Brooklyn. Hinduism, Islam, Buddhism, Sikhism, Taoism, and many other religions have formal houses of worship in the area. Along with these religions, there are also many people who practice no religion at all. ^ "Population Change for the Ten Most Populous and Fastest Growing Metropolitan Statiscal Areas: 2000 to 2010". U.S. Census Bureau. March 2011. p. 6. http://www.census.gov/prod/cen2010/briefs/c2010br-01.pdf. Retrieved 12 April 2011. ^ "Annual Estimates of the Population of Combined Statistical Areas: April 1, 2000 to July 1, 2009" (CSV). 2009 Population Estimates. United States Census Bureau, Population Division. http://www.census.gov/popest/metro/tables/2009/CBSA-EST2009-02.csv. Retrieved 2010-03-23. This page uses content from the English language Wikipedia. The original content was at New York metropolitan area. The list of authors can be seen in the page history. As with this Familypedia wiki, the content of Wikipedia is available under the Creative Commons License.